Ya dig? Worrying doesn’t harmonize with the hippie way of life. Worrying about what time it is or worrying about your hair getting too long? Nah, just take a chill pill, man. You don’t want to spend your whole life worrying about all the small things in life and you definitely never want to worry about your pants falling down. A true hippie would never trouble their mind over such a small thing… and that’s why these groovy suspenders are a such a blessing for hippies across the world! These peace sign suspenders make worrying about your pants falling down a thing of the past. They’re made out of an elastic material and they feature adjustable clips that attached to your pants. They have a rainbow pattern on the exterior, to show that you embrace all the colors of life, and even have little peace signs on them. Just clip them into your pants and you can head to a better future filled with no worries! 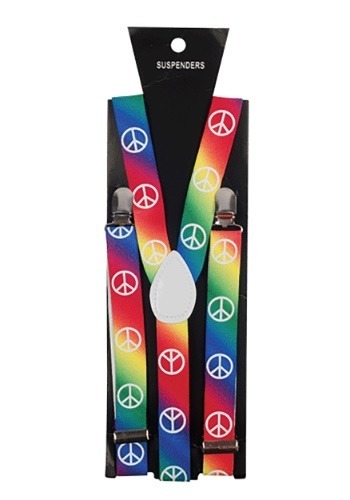 Nothing will harsh your mellow when you’re wearing these peace sign suspenders! Add them to your hippie costume or just wear them as a fashion statement!